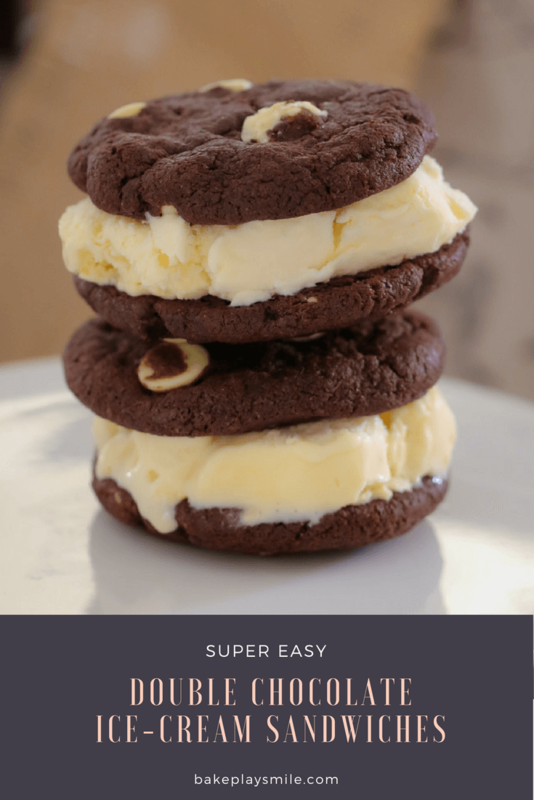 These super easy Double Chocolate Ice-Cream Sandwiches are the perfect summer dessert! Chocolate + vanilla = a winning combo! 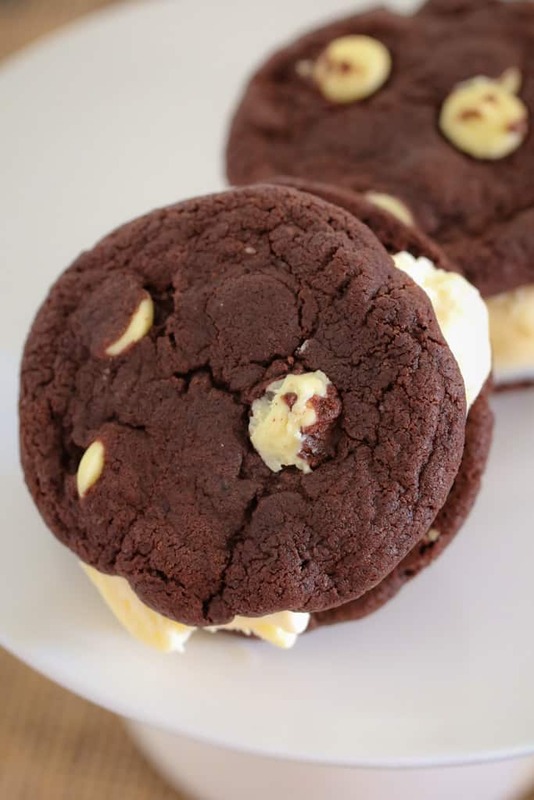 Do you know what’s even better than a delicious double chocolate cookie?? 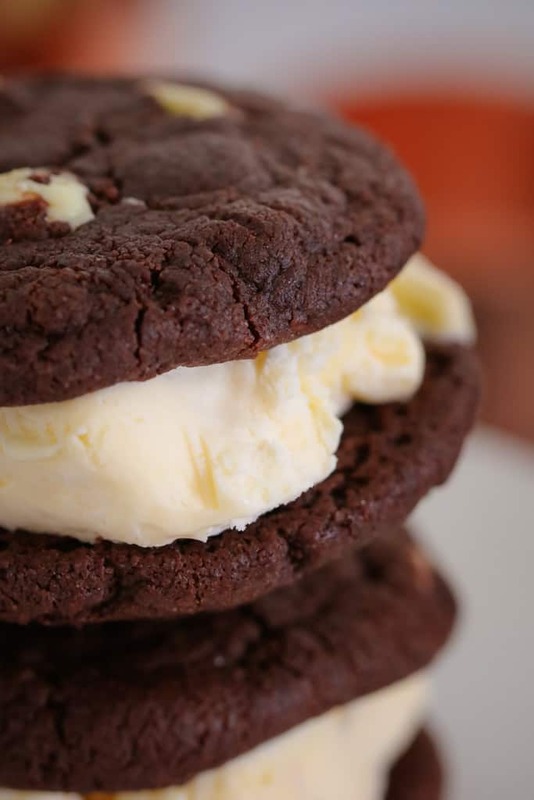 TWO delicious double chocolate cookies WITH ICE-CREAM sandwiched inside! Yep, these yummy little bites are made using my favourite Double Chocolate Chip Cookie recipe. It’s such an easy recipe and makes the BEST rich and chocolatey cookies. 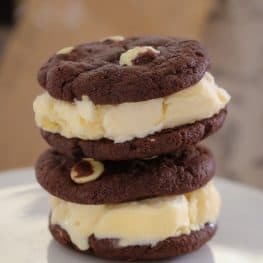 I filled my Double Chocolate Ice-Cream Sandwiches with plain vanilla ice-cream but you could use absolutely any flavour you like (or have in the freezer!). 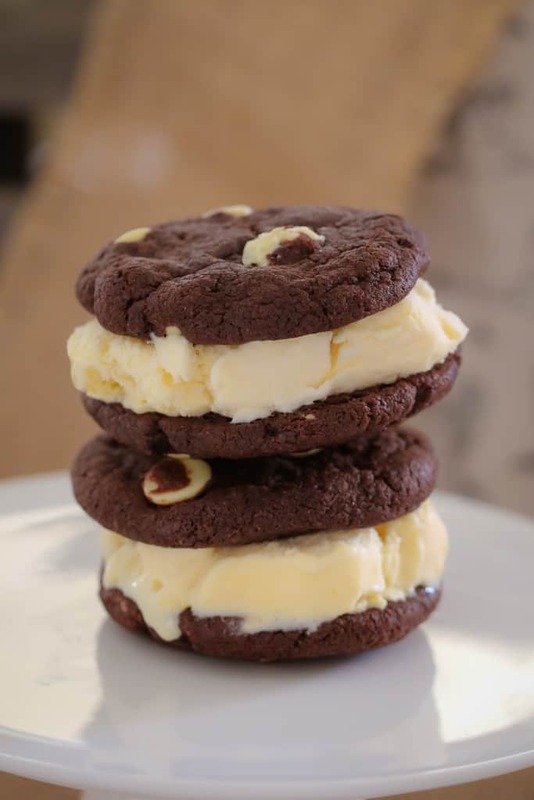 Once the cookies have cooled completely, simply pop a couple of good scoops of ice-cream onto the flat side of one of the cookies and sandwich together with another cookie. Too easy and FAR too addictive. So there you have it… the perfect no-fuss, quick and easy dessert that absolutely everyone will love! PS. 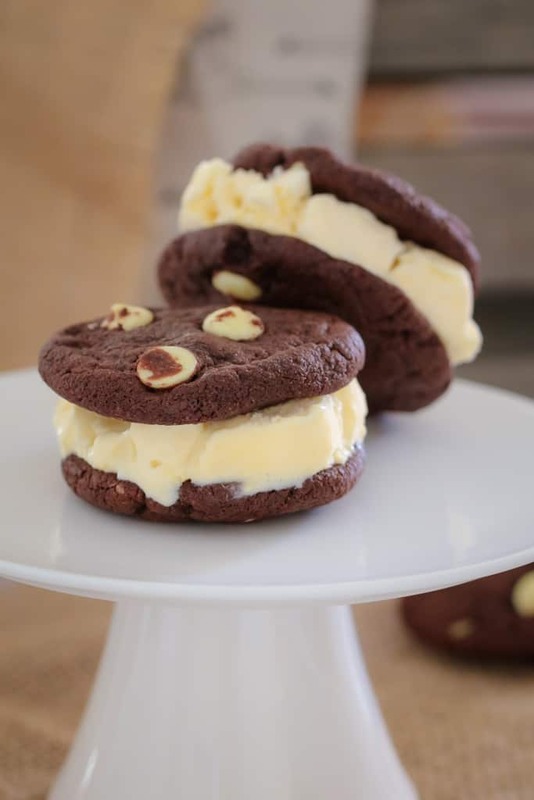 If you need some more ice-cream sandwich inspiration – check out my Peanut & Chocolate version!! 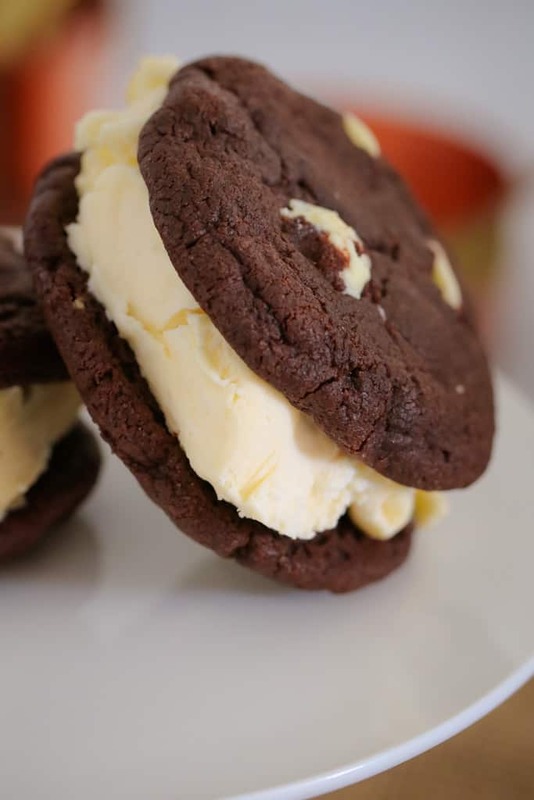 These super easy Double Chocolate Ice-Cream Sandwiches are the perfect summer dessert! Preheat oven to 180 degrees celsius (fan-forced). Line two large trays with baking paper and set aside. Beat the butter, brown sugar and caster sugar together until pale and smooth. Add the vanilla extract and beat through. Sift over the plain flour, cocoa powder, salt and bi-carb soda. Mix through until thoroughly combined. Add the chocolate chips and stir through. Place the dough into the fridge for 30 minutes to chill (see note). Roll heaped teaspoons of the mixture into balls and press down slightly. Place 5 cm apart on the baking trays. Bake for 8-10 minutes or until just set (see note). Allow to cool for 10 minutes before carefully transferring to a wire rack to cool completely. 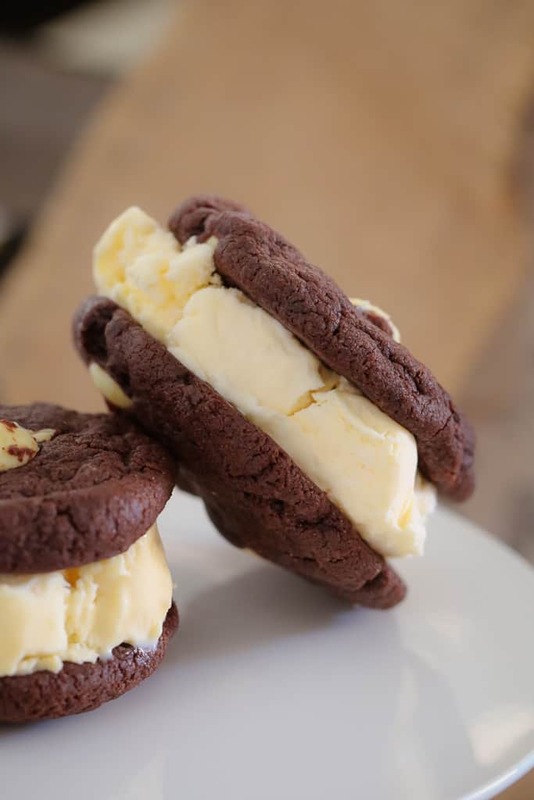 Spoon 2-3 tablespoons of ice-cream onto the flat edge of one cookie and sandwich together with another cookie. Serve immediately. Chilling your cookie dough will ensure they hold their shape better when cooked. It is optional to chill the dough however. For soft and chewy cookies, ensure that you don't overcook them. Once they have just started to set, remove from the oven and allow to cool (they will be very soft when taken out of the oven but will firm up as they cool). Insert the butterfly and add the softened butter (chopped), brown sugar and caster sugar. Mix on Speed 4, 30 seconds or until smooth and creamy. Reduce to Speed 2 and add the eggs, one at a time, through the MC hole. Add the vanilla extract and return to Speed 4 for a further 10 seconds. Remove the butterfly and add the plain flour, cocoa powder, salt and bi-carb soda. Mix on Speed 5, 20 seconds. Add the chocolate chips and mix on Reverse, Speed 4, 10 seconds.